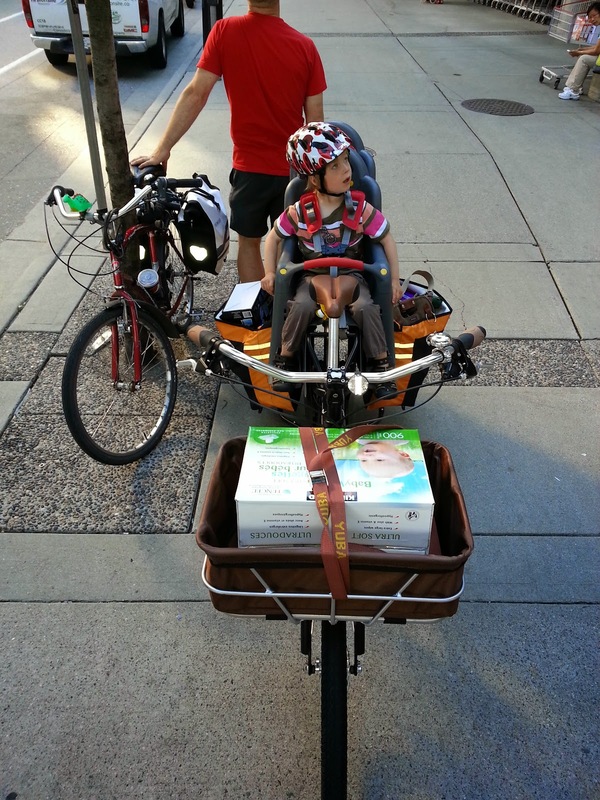 Something I'd been itching to do with our new cargo bike as soon as we picked it up from The Bike Doctor was going on a Costco run. Our local Costco is only about 4km away and most of the route is bike path or traffic-calmed bikeways. 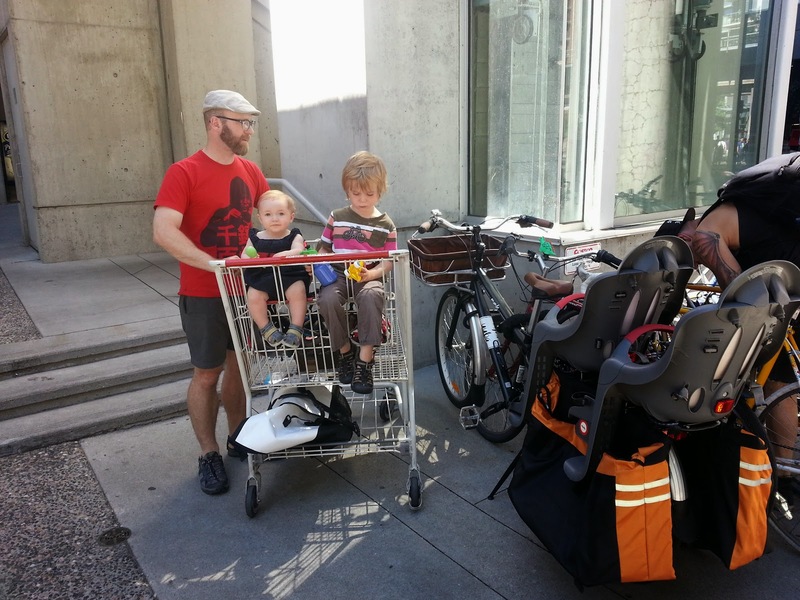 Despite it being easy to ride to, it's not that easy to fit our typical haul on one regular bike--we usually booked a Modo vehicle for our previous shopping trips. 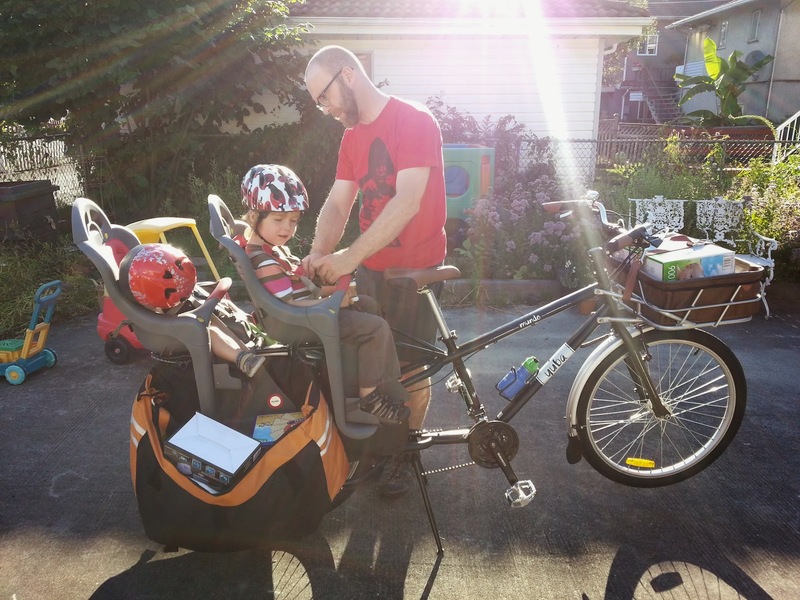 Now that we've got the Yuba Mundo cargo bike, there's no excuse. 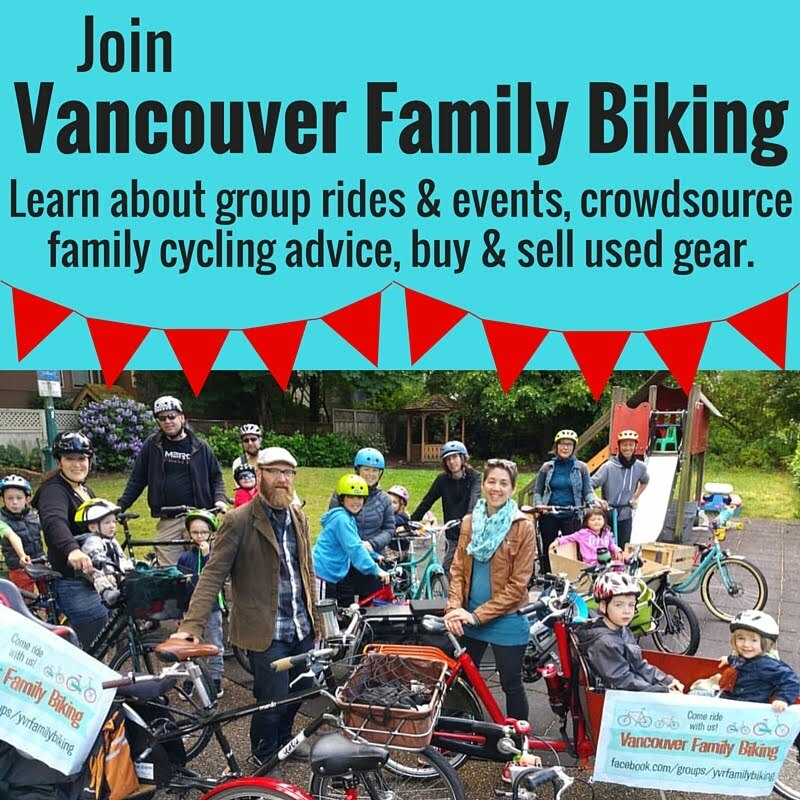 We don't have to book Modo cars just to go shopping there, we can do it by bike. By my calculations, this will save us about $200 a year--that's about what we'd spend on monthly car sharing bookings to Costco. Our first trip was about a week ago, Oliver on my cruiser/hybrid, me and both kids on the Yuba. I decided not to go too crazy so we left a few things off the list that weren't essential. Oliver also carried quite a few of the heavier things in his panniers on the way home, like a large watermelon and a few kilos of peanut butter and coconut oil. I'm not sure what the total weight of the groceries was, but the total amount we spent was about the same as we usually would with a car. A notable weighty item that we wouldn't normally get was a case of nine packs of baby wipes. We use cloth ones, along with cloth diapers, but picked up a case of the disposable ones for our friends' newborn. It fit well in the Bread Basket as you can see in the photo, held secure with the Yuba ratcheting cargo strap. The rest of my load went into the GoGetter panniers, which work fine as open bucket-like bags under the Peanut Shell seats. This does mean they splay out quite wide, however, which is something to be aware of if riding between bollards or other barriers along the route home. Oliver offered to ride the Yuba home, but I wanted to see how it handled & if my legs could take it all the way up the hill home. It's a bit of a slog, getting up that hill. According to Google, it's around a 50m elevation gain, most of which is in about one kilometre of the route. I geared down as low as I could, just kept pedaling and I made it. It isn't for the faint of heart, but I honestly think I've worked harder in spinning class. All in all, a successful trip! I'll definitely do it again. It would probably be a fairly easy ride without the 60 pounds of kid on the seats--maybe next time I'll just go alone. Just in case you were wondering, here's the google map info on most of our route plus elevation. Did you know the bicycling routes show your elevation gain on a handy chart when you click 'get directions'? 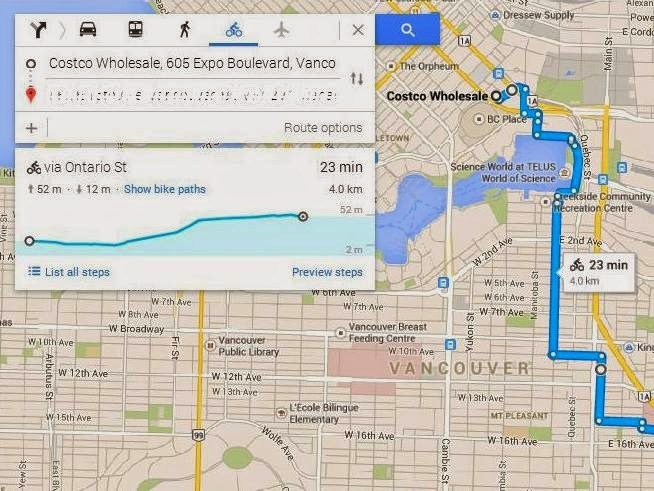 It's a neat newish Google Maps feature for bike route planning if you want to figure out the flattest route.